When President Joko Widodo was presented with an army beret recently, he caused general amusement by planting it like an upturned flower pot on his head, rather than flattening it rakishly across his right ear. No-one bothered to tell him how incongruous it looked. It left observers wondering whether his ignorance of millinery is matched by a seeming ignorance of the military and the implications of him using it as a counterbalance to a national police force that has shown a disturbing refusal to accept his orders. After more than a decade behind the scenes, the Indonesian Armed Forces (TNI) needs no encouragement, seeking to revive a modified version of its Suharto-era ‘dual function’ doctrine and claw back some of the powers it lost with the birth of democratisation. Outgoing TNI commander General Moeldoko’s ‘multi-function’ concept envisages a larger role for the TNI in counterterrorism and a return to the days when military officers occupied positions in the civilian bureaucracy. Aware that its legitimacy depends on a full commitment to democracy, the military is clearly seeking wider influence rather than trying to regain political power. But a foothold in civilian affairs does also make it better placed to recover some of its previous commercial interests. The fact that Widodo didn’t reject the plan outright suggests he’s giving it serious consideration, underlined most recently by his decision to break with tradition and select another like-minded general as TNI commander. Ever since reformist president Abdurrahman Wahid introduced the practice in 2000, the country’s highest military post has been rotated among the three services as a way of keeping the once-dominant army in its place. Under normal circumstances, newly-appointed Air Force Chief of Staff Air Chief Marshal Agus Supriatna would have been expected to replace the politically-ambitious Moeldoko, who reaches the retirement age of 58 later this month. But Widodo ignored the advice of his own party and instead nominated equally-outspoken Army Chief of Staff General Gatot Nurmantyo, potentially giving the 55-year-old general nearly three years at the helm. Analysts believe Widodo’s choice of Nurmantyo was taken at the advice of Moeldoko, who could be in line to take over from Tedjo Purdijatno as chief political minister in a widely-anticipated post-Ramadan cabinet reshuffle. The retired admiral was brought off the bench at the last minute after PDI-P matriarch Megawati Sukarnoputri opposed Widodo’s choice of his long-time business partner, ex-special forces general Luhut Pandjaitan. Pandjaitan went on to become presidential chief of staff in a quid pro quo for Widodo’s ill-fated nomination of corruption suspect Budi Gunawan as the next police chief, a move that weakened his presidency in ways which are still being felt. Rising through the ranks during an era when the TNI was under a US military embargo, Moeldoko and Nurmantyo have had little overseas experience and their public statements often reflect outmoded thinking and a heavy reliance on conspiracy theories. Nurmantyo’s November 2013 anti-democracy outburst was all the more surprising because he had only been in charge of Kostrad for six months after a career in which he has served as East Java commander and head of the army’s training command. The head of the military think tank, retired civilian Defence Ministry official Budi Susilo Soepandji, said  ‘excessive freedom’ had led to radical ideologies that were undermining the country’s bedrock values encapsulated in Pancasila, the state ideology. Now the new army chief, Nurmantyo is back on his soap box, this time claiming that Indonesia  was in the throes of a ‘proxy war’ conducted by NGOs, mass organisations and individuals, all working for foreign interests. In speeches around the country and in bizarre diatribes on social media, he said Islamic terrorism, the plundering of natural resources and spreading drug addiction problem were part of the same international conspiracy. Self-serving as its criticism of civilian officials may be, the military has been riding a wave of public outrage over the blatant and continuing efforts of police and politicians to undermine the Anti-Corruption Commission (KPK). Since the Budi Gunawan affair, the police have ignored the president’s instructions to back off from its anti-KPK campaign, with chief of detectives Commander-General Budi Waseso even refusing to disclose his wealth to the commission as is required under law . Widodo sent Nurmantyo’s nomination to Parliament on the same day the TNI headquarters announced the creation of a new multi-service anti-terrorist unit , the latest step in a concerted campaign to win back a role for itself in domestic security operations. 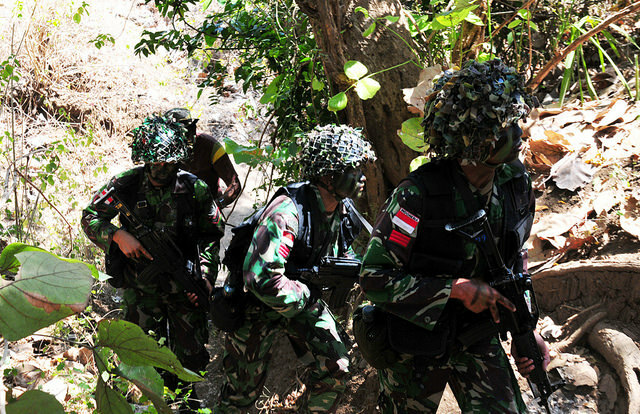 Last March, the army mounted a 3,000-person operation to capture wanted terrorist leader Santoso  in the jungles of Central Sulawesi. The fugitive escaped, but the sweep exposed the shortcomings of the police in pacifying the country’s hottest trouble-spot. Moeldoko then used the opening to get permission to leave a mission-ready battalion in the Poso area and also to criticise the Defence Law which requires parliamentary approval for soldiers to confront domestic threats outside of wartime. How far Nurmantyo is prepared to go on pushing the envelope will likely depend on whether Widodo can get a better grip on his eight-month presidency, seemingly unable so far to deal with policy inconsistencies that prevent the economy getting back on track. The president’s lack of interest in security and foreign affairs and the military’s historical distrust of civilian politicians suggest the TNI’s expanding role will continue, exacerbating tensions with the police in the process and leaving the country’s neighbours in some doubt about where Indonesia is headed. John McBeth is a Jakarta-based correspondent who has covered Southeast Asian politics for more than 40 years. Image courtesy of Flickr user US Pacific Command.